American fingerprints are all over a botched commando raid in the southern Philippines that left dozens dead and shocked the country. This article is a joint publication of TheNation.com and Foreign Policy In Focus. An earlier version appeared in Telesur English, which graciously gave its permission to reprint it. By the end of the morning, dozens lay dead. The episode has severely discredited the administration of Philippine President Benigno Aquino III, jeopardized decades of progress on peace talks with Moro separatists and underlined the perils for developing-world governments that put themselves at the beck and call of Washington. The commandos were able to kill Marwan, who’d sat high on the FBI’s list of “Most Wanted Terrorists.” But then all hell broke loose. The insurgents woke up and opened fire on the intruders, forcing the commandos to leave Marwan’s body behind. They had to content themselves with cutting off the corpse’s index finger to turn over to the FBI. As they retreated, nine of the Seaborne commandos were killed. They radioed for help, but they were told that the “Quick Reaction Force” charged with covering their withdrawal was already pinned down in a flat cornfield with little cover. 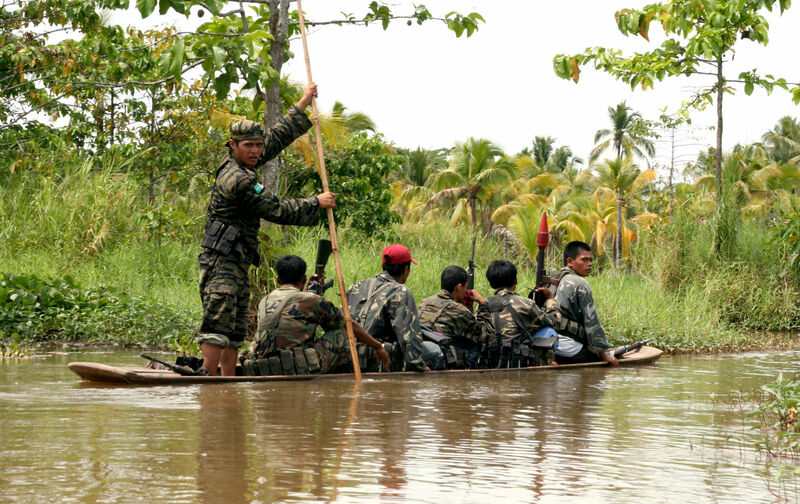 Over the next few hours, that separate unit of thirty-six men was picked off one by one by Moro snipers. Only one of the thirty-six survived, by running for his life and jumping into a nearby river. All in all, forty-four policemen died in the bloody battle. Moro fighters estimated that eighteen of their combatants and about four civilians were killed. A timely rescue effort was not even mounted, since an infantry battalion in the area wasn’t informed till late in the morning that the commandos were under fire. When ceasefire monitors finally reached the cornfield late in the afternoon, long after the battle ended, they found corpses that had been stripped of their weapons and other gear, some exhibiting wounds that indicated they had been shot at point-blank range. The “Mamasapano Massacre,” as it has come to be called, upended Philippine politics. The biggest casualty was the Bangsa Moro Basic Law that was in the last stages of being shepherded through the Philippine Congress. Known as the BBL, the bill was the product of nearly five years of intensive negotiations between the government and the Moro Islamic Liberation Front to put an end to almost fifty years of fighting in the southern Philippines. It would have created an autonomous region for the Muslim Moros, a fiercely independent people that have long resisted integration into the broader Filipino polity. With emotions among the Christian majority running high, congressional approval of the BBL was thrown into doubt, threatening an eventual return to hostilities. Some politicians rode on the incident to stoke the latent anti-Muslim prejudices of the dominant culture—not just to derail prospects for Moro autonomy, but also to advance their own political ambitions. Under congressional questioning, the facts of the raid were extracted piece by piece—on national television—from high-level administration officials. Their feelings seemed to run the gamut of guilt, grief, disbelief and resentment at not being “in the know” about the planned incursion. The decisive element in the unraveling of the operation, it appears, was the deliberate withholding of information from key people at the top of the police and armed forces hierarchy. Only the president, the Special Action Force commander and the national police chief, Gen. Alan Purisima, knew about the mission. Though suspended from office on corruption charges, Purisima—a trusted aide of the president—was effectively in charge of the operation, bypassing the acting police chief and the secretary of the interior, who knew nothing of the mission until disaster overtook it. Emerging in the hearings was the following portrait of the tragedy: The officials who conceived and implemented the operation to nab Marwan chose not to inform the top people in the police and military leadership. They also ignored and subverted the carefully negotiated procedures for territorial access worked out among the Moro Islamic Liberation Front, the government and third-party monitors. The Liberation Front fighters—along with fighters from a die-hard separatist group, the Bangsa Moro Islamic Freedom Fighters—responded that morning to what they perceived as a large invasion force. Once the battle began, it became very difficult for their leaders to realize the intent of the commando contingent and get their forces to disengage. It seemed evident, too, that some wounded policemen were finished off execution-style, though it was not clear which group was responsible for these atrocities. The big puzzle for many was why a government that was in the last stages of negotiating an autonomy agreement to end fifty years of warfare would endanger this goal—said to be a major legacy priority for President Aquino—with a large-scale commando intrusion into Moro territory without informing its negotiating partner. To an increasing number of people, the answer must have something to do with Washington. Indeed, Washington’s fingerprints were all over the operation: There was a $5 million bounty placed by the Americans on Marwan’s head. A US military helicopter appeared in the area after the long firefight, allegedly to help evacuate the wounded. Marwan’s finger disappeared after the battle and showed up at an FBI lab in the United States a few days later. Filipino officials have remained tight-lipped on the question of US participation in the raid, invoking “national security” or choosing to make revelations only in secret executive sessions with the Senate. Thus it has fallen on the media to probe the US role. Perhaps the most reliable of these probes was conducted by the Philippine Daily Inquirer, which found that US drones had pinpointed Marwan’s hiding place, guided the commandos to it and provided the capability for real-time management by the Philippine commanders away from the battlefield. American advisers, the paper claimed, were the ones who had vetoed informing top officials of the police, the armed forces and the Liberation Front of the planned raid on the grounds that news of the action would be leaked to Marwan. Finally, the original plan was to have a fused team of Seaborne Unit commandos and the Quick Reaction Force. But that was reportedly rejected by the American advisers, who favored having the Seaborne Unit carry out the raid itself and the Quick Reaction Force provide cover—a plan that proved disastrous. The Seaborne Unit, it emerged, had been trained by “retired” Navy Seals and functioned as the Americans’ special unit within the special forces of the Philippine National Police. As the details of the American role emerge, the pressure is on President Aquino to admit complicity in a Washington-directed operation, which he has so far refused to do. Aquino has come under intense fire from nationalist quarters that earlier criticized him for negotiating a military pact that allows the United States to use Philippine bases to implement President Obama’s so-called “Pivot to Asia” strategy to contain China. Already under attack for putting a suspended police general in charge of the fatal mission and refusing to admit command responsibility for it, the charge of laying down Filipino lives for an American scheme appears to have forced the president further into his bunker, creating the widespread impression of a drift in leadership that, it was feared, coup plotters and other adventurers—of which there is no shortage in the Philippines—could take advantage of. There is a personal postcript to this. As a sitting member of the Philippine House of Representatives, I withdrew my political support for President Aquino when he refused to accept command responsibility for the operation. Since my party, Akbayan, remains allied to the administration, I resigned as the congressional representative of the party. Walden BelloWalden Bello is an international adjunct professor of sociology at the State University of New York at Binghamton and a former member of the House of Representatives of the Philippines (2009-2015).